Leisure Suit Larry Remake Makes Its Half-Million Bucks, Thanks To You? The guy on the left is Al Lowe, adventure game pioneer and lead creative force behind the Leisure Suit Larry games. 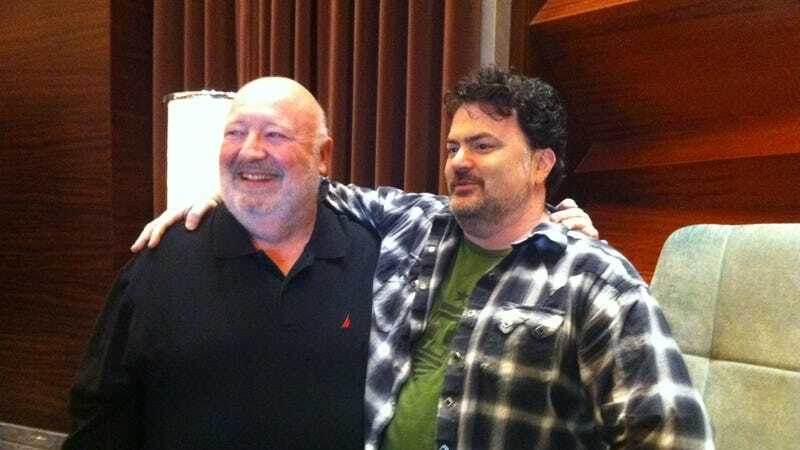 The guy on the right is Tim Schafer, adventure game pioneer and lead creative force behind Day of the Tentacle and other LucasArts classics. When I took this photo, in February, Tim was on his way to pulling in more than $3 million from fans who wanted to fund his team's Kickstarter idea of making a new old-school adventure game. Tim and I were discussing this when Al walked up with his friends at Replay Games. Today, Al and the rest of their team have just passed their $500,000 goal for their Kickstarter. Their Kickstarter is about bringing the Leisure Suit Larry games back, starting with the first one that introduced us to Larry and turned launched one of the most popular, raunchy game comedies ever. A His team wants to re-do the first game, improving the graphics, adding voice, and so on, releasing on PC, Mac and mobile (read all about it here.). Al's Kickstarter still has six more days to go for those who want to offer even more. Al Lowe is jubilant today, of course. The comeback he's wanted for Larry is happening. "I'm so proud and pleased that so many of Leisure Suit Larry's fans saw fit to make computer software's most lovable loser into a winner!" he told Kotaku in an e-mail. "I'm overwhelmed by all the love and promise to give them everything they've been missing."